It's here! It's FINALLY here! I've been so excited for this collection from the moment the press release hit my inbox. 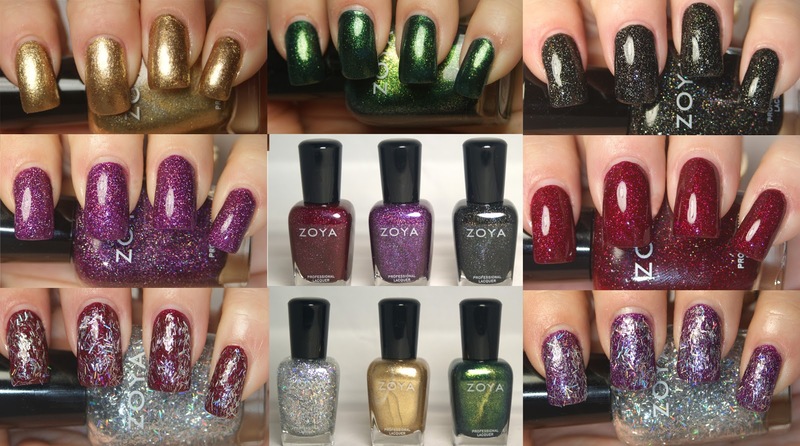 The Zoya Ornate Collection features six shades, three scattered holographic polishes, two foils, and a bar glitter. That's a pretty awesome variety for a seasonal release, which is usually saved for the same silver, gold, green, red, blue, and white shimmer/glitter bombs from year to year. Also... five out of the six polishes share names with superheroes. So, that's not exactly a negative for me! Warning, this is going to be a pic-heavy post! From left to right: Blaze, Aurora, and Storm. From left to right: Electra, Ziv, and Logan. First up is Ziv, a gold foil polish. 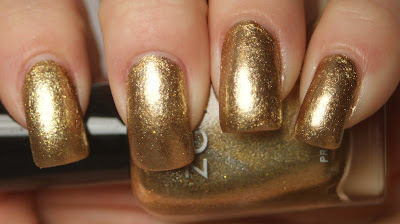 This is definitely a polish different from any other gold that I own. It looks like molten gold, which has a really pretty, rich look. However, I don't wear enough gold foil polish that this would have been one I sought out. But, for those of you who DO wear metallics, this is a must-have! The above is with two coats. The application was very fluid and easy to work with. This is Logan, a forest green foil polish. This is like a Douglas Fir in a bottle. I LOVE it. I know that I'm going to be reaching for this shade repeatedly during the Christmas and Holiday Nail Art Challenge season. The application was a DREAM. It was opaque in two coats, which is nice for a rich foil like this one. From the promotional images, this has drawn a lot of comparison to Ivanka. Ivanka's green base is a little bluer, where as Logan has yellow undertones and far less gold foil in it. Here, you can see the comparison a little better in similar light. I'd say Ivanka is more of a kelly green. Next up is Aurora, which shares its name with both a Disney princess(!) and a member of the X-Men(!!!). Though, not to be confused with Ororo Munroe, aka Storm. Okay, enough geeking out for a moment. 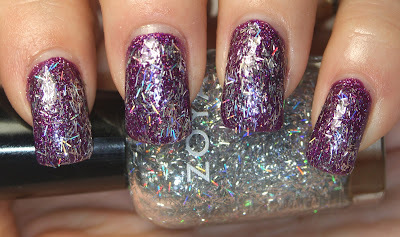 Aurora is a violet scattered holo polish that, in my opinion, is the biggest stunner of the collection. And that's saying a lot in a collection that blew me away with just six shades. 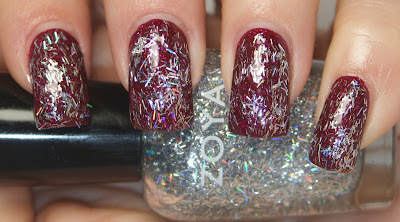 Here is Blaze, a rich cranberry scattered holo. 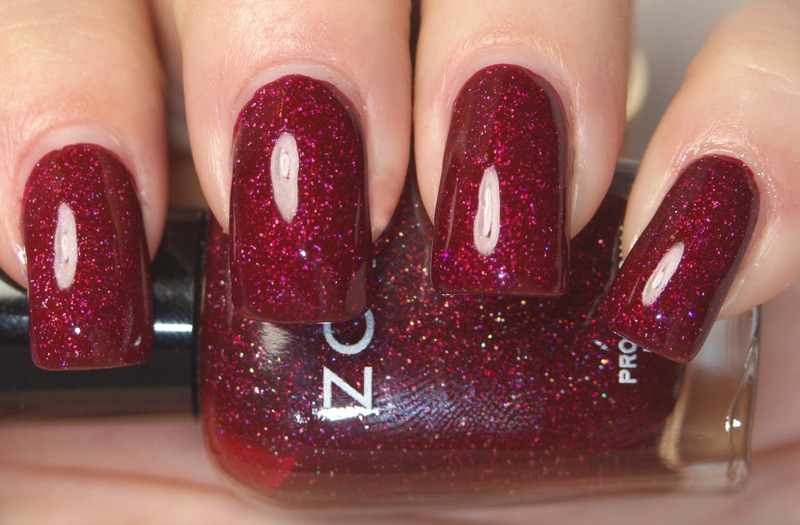 This is the perfect holiday red. 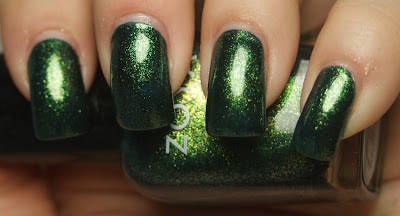 It's not as much of a pronounced holo as in Aurora. But this is what Blaze's violet counterpart looks like under low light. 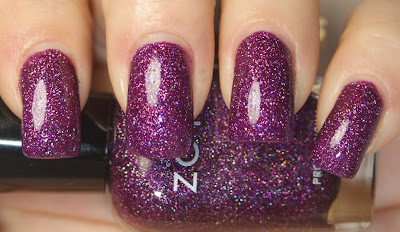 It has a beautiful luster to it with just two coats. Yet again, perfect consistency for application. 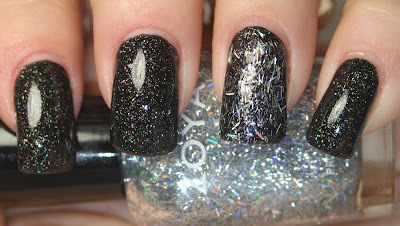 And the last of the holos is Storm, a scattered black holo polish. Oh. My. Goodness. This packs a wallop of sparkle. I really like the vampiness of this polish. Sometimes, a girl just wants to be a little rocker chic and Storm offers that. Also, it reminds me of snowfall at night. This is a great color I can wear for Halloween, oddly enough. Two coats here applied like a dream. The last polish I swatched is the silver bar glitter top coat, Electra. It has some holo qualities to it, so I wanted to see how it looked with a holo polish as a base. This is one coat of Electra over Aurora. This is one coat of Electra over Blaze. Electra as the accent nail with Storm. I think that the bar glitter is cute, but I wouldn't wear it on its own or on all of my fingers. I think it would be really nice as an accent nail. It actually reminds me of those little Bon Bon polishes my mom bought me when I was little. Though, I highly doubt this is going to dry up within a week or get all gloopy. The formula on this was a little thick, BUT the upside to that is even application with only a few swipes of the brush. I don't have to worry about dabbing it, which is nice and allows it to dry quicker. Overall, I was in LOVE with this collection. 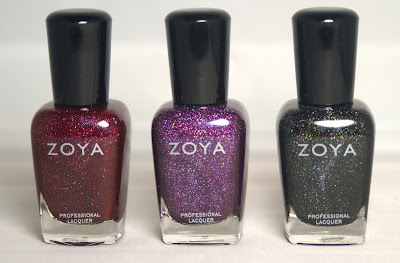 Of course, the three holos in Aurora, Blaze, and Storm were my favorite. Logan was a beautiful, glowing green and Ziv was a rich gold, though not my particular cup of tea because I'm not a metallics fan. Electra is a nice little option for a quick accent nail without much fuss for a night out. 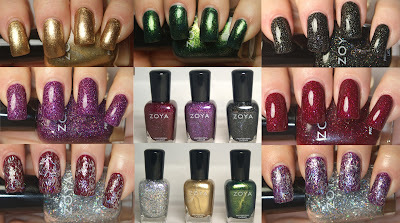 The entire Ornate collection is available at Zoya.com for $8 per bottle. 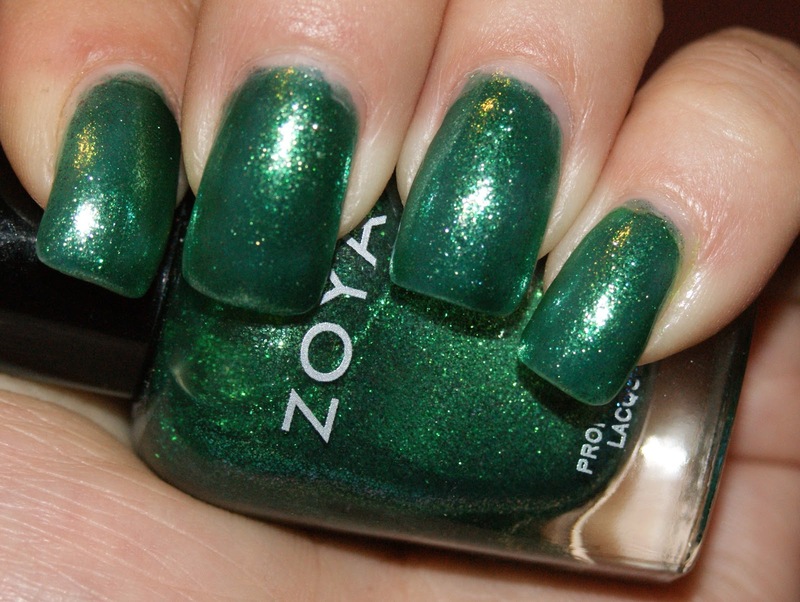 You can also find Zoya at your local Ulta store. Are you going to be picking up any of the Ornate shades? And do you love these as much as I do? Pretty! I wonder if Ziv would work as a stamping color.